VISTA D’ORO 2ND ANNUAL WALNUT FESTIVAL – ONE FINE DAY! The grounds and surrounding countryside of Vista D’oro Farms and Winery are breathtaking. Add to that a sunny day, a fine selection of wine, artisanal preserves, other local gourmet offerings, the soothing ensemble of jazzy tunes and incredibly friendly people, we begin to wonder how it is possible that we have chosen to be “city folk”. Lee and Patrick Murphy have created a little paradise in Langley, barely north of the border, that is inviting and homely but which also produces a variety of preserves, jams and wines that would delight the most sophisticated palate. Vista D’oro Farm and Winery is a destination that is well worth the trek. PÉCHÉ MIGNON had the pleasure of taking part in the Vista D’oro 2nd Annual Walnut Festival today, alongside the likes of Executive Chef Sean Cousins from the venerable Vancouver Club, Chocolate Arts and local food producers JD Farms Turkey and Krause Berry Farms. Patrick suggested the wine pairings for our savoury shortbreads. The Cheddar & Red Pepper was paired beautifully with the 2010 Pinot Noir as well as the fortified Pinot NoiX while the Parmesan & Rosemary was paired with NV Murphy’s Law. It would be fair to say that the pairings were crowd-pleasers. We have rarely received such an enthusiastic response to our shortbread from so many in one sampling. We know it was the wine that did it- the quality thereof and the synergy of the pairings, not the quantity (but that may have also helped!). In addition, Lee suggested a selection of Vista D’oro preserves that guests could pair with our savoury shortbreads as well as the sweet varieties – Cranberry & Orange and Apricot & Pistachio. Crowd favourites were the Fig & Walnut Wine with the Parmesan & Rosemary and the Orchard Pear & Pinot Noir with the Cheddar & Red Pepper. Not far behind were the Green Walnut & Grappa with the Parmesan & Rosemary and the Craft Beer Jam with the Cheddar & Red Pepper. The sweet varieties of shortbread worked well with just about all of the preserves! We had a great day out and thoroughly enjoyed working non-stop for almost 4 hours, yet feeling relaxed doing it because of the surroundings. That must be the secret to the Murphys’ success! 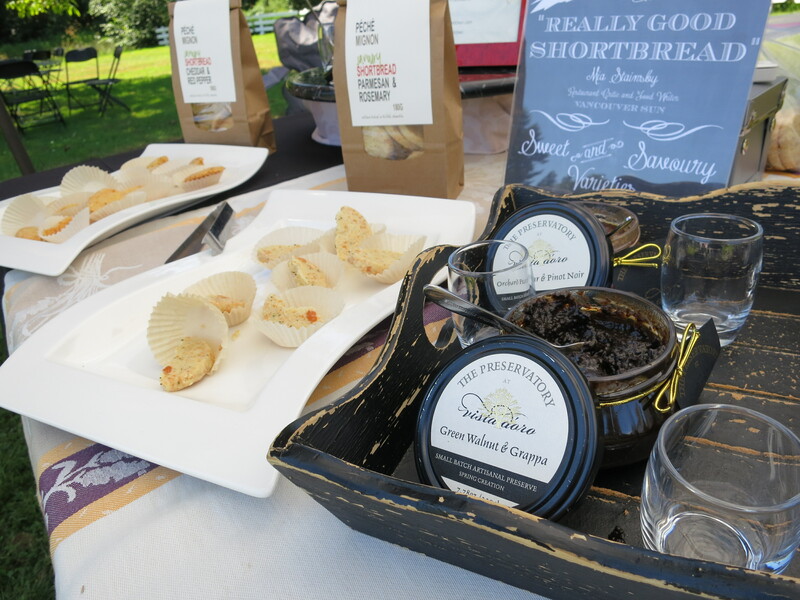 Look for our shortbread in Vista D’oro’s Farmgate Shop & Tasting Room soon, we hope!